This Women’s Month, LG reinforces its commitment to women empowerment by ensuring that its smart home technologies are attuned to the constantly changing and dynamic needs of both women and men who use them.LG Smart Home Technologies help level the playing field. 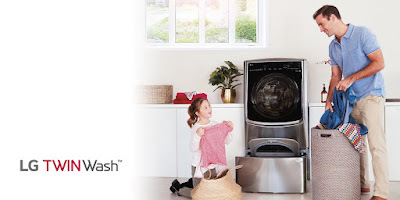 LG’s Laundry Love is an advocacy that wants to give them the opportunity to show that they can and should get the job done, with washing machines that are powerful and packed with innovative features. To demonstrate that alpha-males, and even working dads can do it, motoring expert James Deakin, actor/model Eric ‘Eruption’ Tai, and PBA’s ‘Ironman’ LA Tenorio went onstage at the LG Laundry Love campaign launch to wash their family’s clothes. James, who is used to running at high speeds, used the LG Front Load washer with Turbo Wash technology, with a unique jet spray for excellent washing performance in less than an hour. Eric, who just had a baby with wife Rona, used the LG Top Load washer with its Baby Steam Care function that offers deep clean for baby clothes, along with Allergy Care that removes 99% of allergens to care for his newborn’s sensitive skin. LG also opened its doors on the same day to the residents of Barangay Maybunga in Pasig to do their laundry at the LG office using the powerful washers. It is the company’s way of giving back to communities, with the aim of making clean laundry accessible. LG will soon roll out its mobile laundry van soon in the different barangays of Metro Manila. For more information about the #LGLoveLaundry campaign and to see the lineup of LG’s washing machines, log on to lg.com/ph. Follow @LGPhilippines on Facebook for updates and promotions.